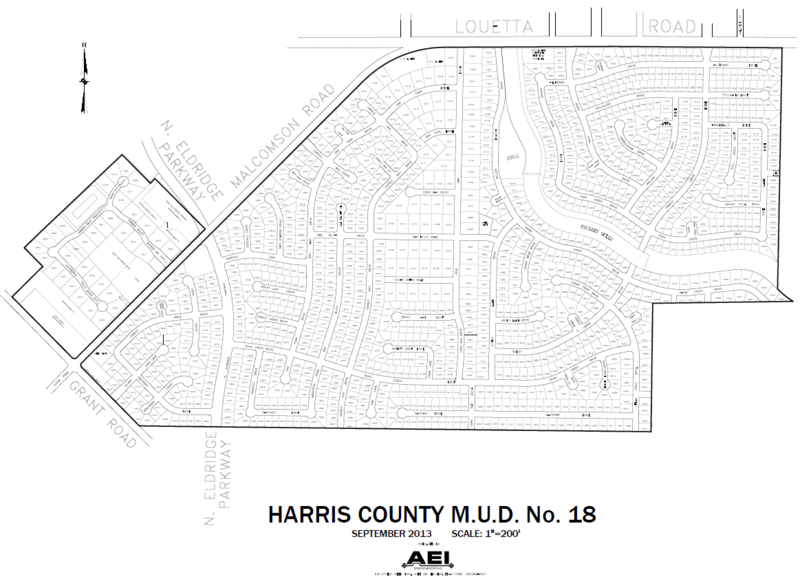 HCMUD 18 comprises approximately 464.2 acres of land and is located 20 miles northwest of downtown Houston. Click here to view the district map. It took our District approximately 14 years to complete construction of the system of water supply and sanitary sewers throughout the boundaries of the District. Today, the entire system includes approximately 15 miles of water lines and associated treatment equipment. We serve about 1422, residential connections and 157 commercial customers with water supplied through 2 water plants, one located on Malcomson Road and the other on Oak Bluff Drive. Our service area customers are single-family residences with some commercial enterprises. The District pumps an average of 88,386,000 gallons during the winter, and as high as 97,222,000 gallons during the summer months. MUD18 does not own its waste treatment facility, but shares ownership of a regional waste treatment plant with three other districts. Storm sewers, an integral part of flood control, are owned and maintained by Harris County, not MUD 18. Should you notice problems with these street drains, please contact Harris County to report these problems (713-684-4000). Should you see yard service workers blowing grass clippings into these drains, please call the Harris County Precinct 4 Deputy’s office at 281-376-3472. It is illegal to dump waste or trash into these storm water drains.